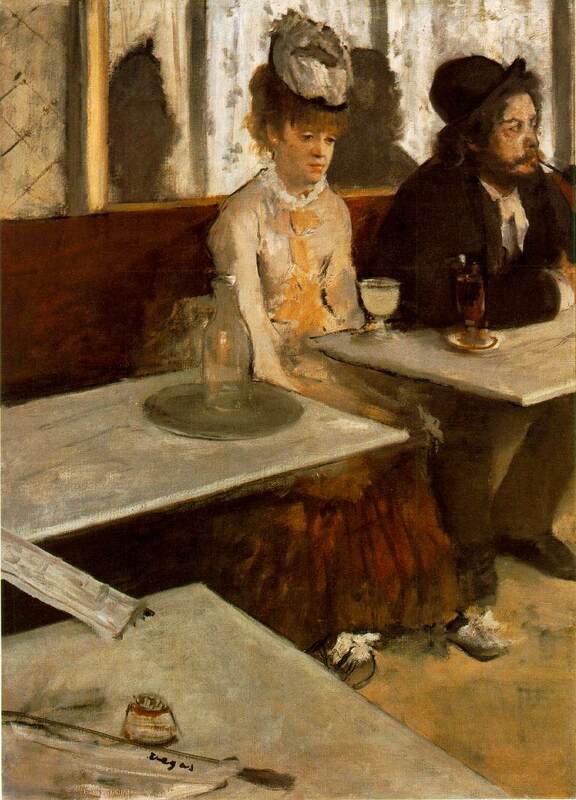 In the well-known painting at left Edgar Degas seems to paint two customers, each lost in their own dreams, in a Parisian cafe. Whether or not Degas was actually there, he leads us to think that he, the artist, was sitting just out of sight at the foreground table. He then used the corner of the table to suggest a work surface. On it he placed a match-stick holder and a portion of a newspaper tied to a rod. He then signed the painting along the rod which intentionally resembles a paintbrush, the rod’s handle as the brush-end. He then painted the matchstick holder next to it to suggest a small pot of paint. In the background the man, modeled on an artist, represents one, smoking a pipe for inspiration. 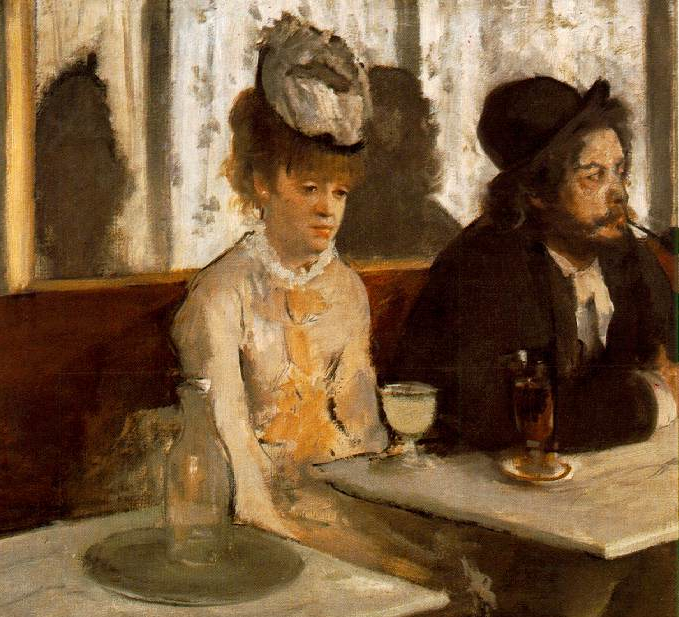 The woman sitting upright is "his painting" with a glass of absinthe in front of her to recall a female version of Edouard Manet's first Salon success, The Absinthe Drinker from 1859. The lack of communication between the two figures is often said by exoteric readers to reflect their fallen state, two boozy drunks too sodden to talk. The true explanation, though, is quite different: the man is an artist, the woman "his painting". She, however, must represent a painted artist framed as she is by a bottle and glass of absinthe. 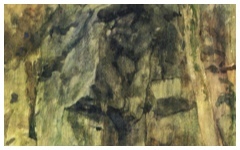 Yet, even though the two figures represent an artist and his painting, both are still depicted inside "Degas' painting", the one that he is painting from the foreground. 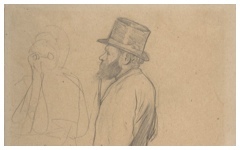 It is a double illusion, in that the unseen Degas paints an "artist and his 'painting'". The mirror is confusing too because while it seems to reflect their figures, the shapes resemble shadows on a wall, a suggestion perhaps that both originated as shadowy reflections in the artist’s mind. This picture with its drink and tobacco helps remind us that both stimulants have had a long tradition in art as symbols of the imagination. Remember those connections when looking at seventeenth-century Dutch paintings of drunks smoking in taverns. 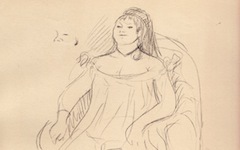 Yet another example of Degas' unseen "self-portraits"
Original Publication Date on EPPH: 16 Jan 2012. © Simon Abrahams. Articles on this site are the copyright of Simon Abrahams. To use copyrighted material in print or other media for purposes beyond 'fair use', you must obtain permission from the copyright owner. Websites may link to this page without permission (please do) but may not reproduce the material on their own site without crediting Simon Abrahams and EPPH.